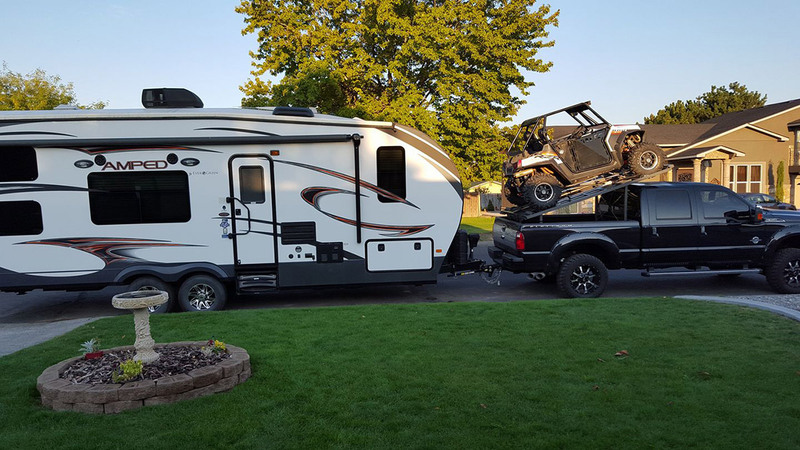 If you know anything about towing or hauling, you know that a brand-new, 30-foot, 13,000 pound toy hauler is a lot for any truck to handle. Add on a bed rack and two Polaris RZRs and things start to get real heavy, real fast. 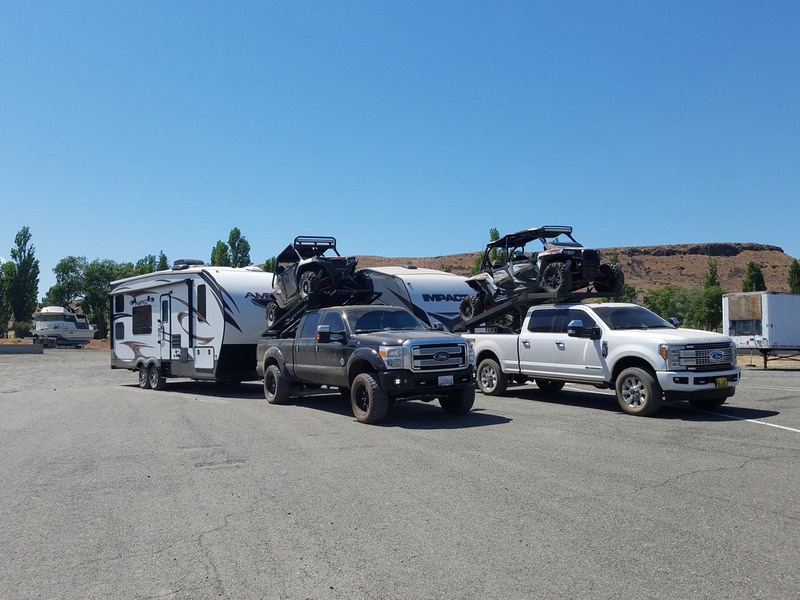 For Mario M. from Washington state, he knew before he even made the purchase of his new toy hauler that the suspension on his 2014 Ford F-350 was going to need a little extra “umph” to hold up the weight on the back end. 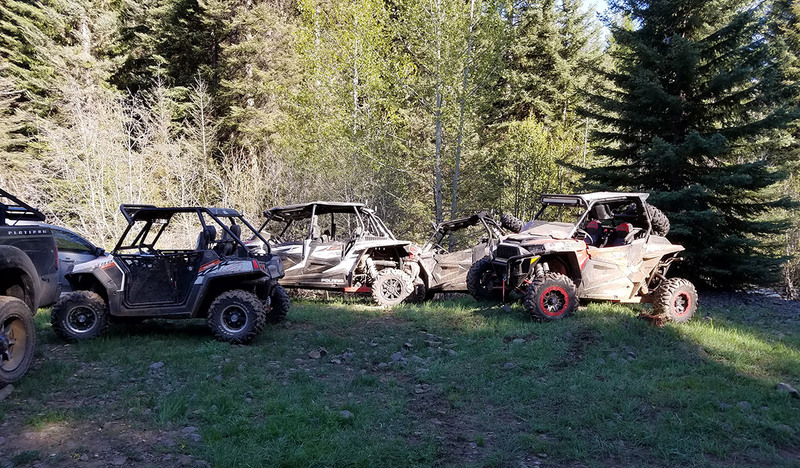 Mario and his wife are RZR enthusiasts – taking their RZR Turbo 1000 and RZR 800 S out almost every weekend, from local lakes and dunes, all the way into the mountains and forests in Oregon. Living such an active lifestyle, Mario knew that he needed to be able to haul his toys with safety and comfort every time he took them out. His truck was already pretty decked out, with a TV, sound system, tinted windows, front steering dampers, and a leveled front end, but he just needed something more. He was familiar with air suspensions, having had air bags on his previous trucks, but he still did his research before getting another kit. After some extensive perusing of AirLiftCompany.com, user forums, and a few happy Air Lift customers, Mario settled on the LoadLifter 5000 Ultimate system and the WirelessAir on-board air compressor system. The 5,000 pounds of load-leveling capacity and independent control of his air springs was exactly what he needed to travel stress-free. After purchasing his air bags and compressor system, Mario had the guys at Commercial Tire install them, so that he was sure to get the job done right. He immediately put the system to the test and went to pick up his new toy hauler, with the bags already on his truck. Since getting his Air Lift system installed, he’s referred his cousins and friends to Air Lift’s load support solutions. Now, Mario knew he had to have air bags, so when a buddy of his with a Ford F-250 asked to borrow the bed rack so he could haul his RZR, Mario didn’t even think twice. The truck should be capable of hauling a 400 pound rack loaded with a 1,500 pound RZR with no problems. It almost seemed like a silly question for Mario, who could comfortably set the cruise control at 63 and be good to go for a stable drive – over bridges, train tracks, everything. After the phone call, Mario realized just how much safety and comfort the air bags were giving him. Special thanks to Mario for taking the time to share his #lifeonair with us!